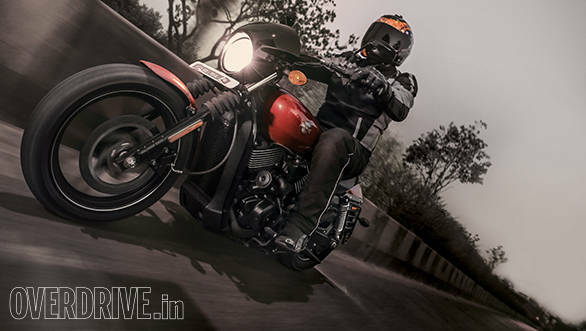 Ever since I laid eyes on the new Harley-Davidson Street 750, first at India Bike Week 2014 and then again at the 2014 Auto Expo, I was raring to swing my legs over one. Every launch of a new motorcycle is exciting but when a manufacturer takes a bold step in a new direction, it makes it all the more special. Rishaad and Shumi came back raving about their ride in Delhi and having missed that opportunity, I jumped at the chance to carry out this test. So here's the lowdown on the looks of the Street 750. The first thing that strikes you when you walk up to the motorcycle is how compact it looks for a Harley. The café racer style bikini fairing up front gives the motorcycle a profile that reminds me of the XLCR 1000 Café from the late nineties. All the matte black bits lend it a more urban chic look that is a pleasant change from the old school chromed cruisers we're used to. It's slimmer and shorter than you'd expect and that's not necessarily a negative. The smaller dimensions actually easily accommodate shorter riders and also make it a much better street motorcycle once on the move but more on that later. The single dial instrument cluster only holds a speedometer, digital readout for odo and trip and telltale lights. A fuel level indicator is missing though there is a light to signal low fuel level. While it does tick a number of boxes in the looks department, its build quality has left some room for improvement. The wiring near the front of the tank is exposed and is not routed very well either and ends up looking quite untidy on closer inspection. The switches are not well finished and you will certainly miss the passing switch on such a fast motorcycle. The mirrors are mounted on very short stalks and only show most riders their elbows or shoulders. There also is a strange, faint ridge running down the centre of the fuel tank. It's not prominent enough to be a design feature and yet not inconspicuous enough to be overlooked. With the extensive aftermarket parts list, you can fix some of these little niggles but on a Harley-Davidson these kind of finish levels are a bit of a disappointment. 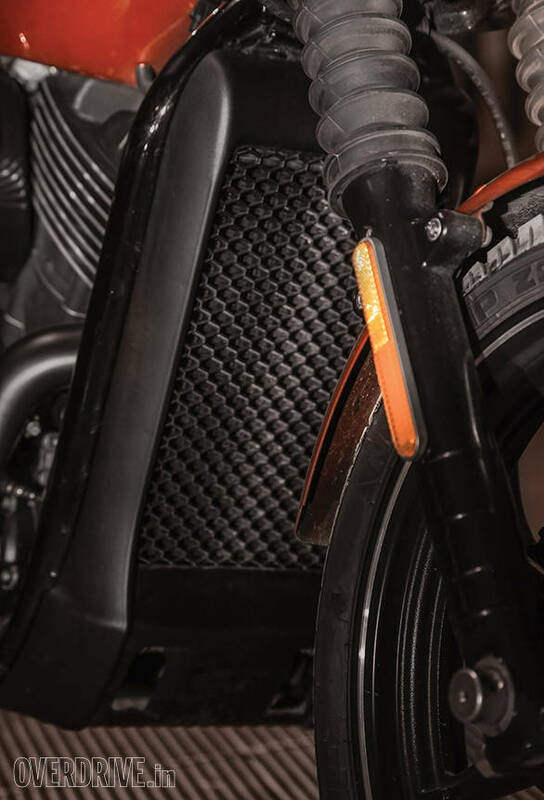 Harley-Davidson are reportedly already working on sorting out some of these issues. The Revolution X is a completely new 749cc 60-degree V-twin, liquid cooled engine. It makes 60Nm of torque at 4000rpm and redlines at 8000rpm. Harley-Davidson traditionally does not disclose power figures but American magazines have tested the twin at around 52PS at the wheel which is quite impressive. It uses chain driven single over head cams with roller rocker arms up top and a single balancer shaft on the bottom end to curb vibes and aid in refinement. Both cylinders breathe through a single 38mm Mikuni throttle body. This dramatic break in a traditional engine formula has given rise to a very likeable motor. There is a linear nature in the way it makes power. This also makes it a very easy motor to come to terms with. The throttle response is crisp and you quickly develop a confidence that is surprising for such a powerful motor. It's extremely tractable too and you can easily slot it in sixth gear and forget about it while on the highway where it's happy to cruise at around the 130kmph mark without any stress. Light it up and it shoots off to an impressive 0-100 sprint, completed in a brisk 6.3s. 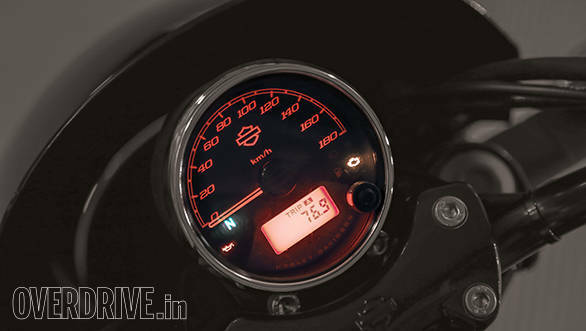 Keep it pinned and it will be happy to max out the speedometer (185kmph indicated) making this one really fast Harley. 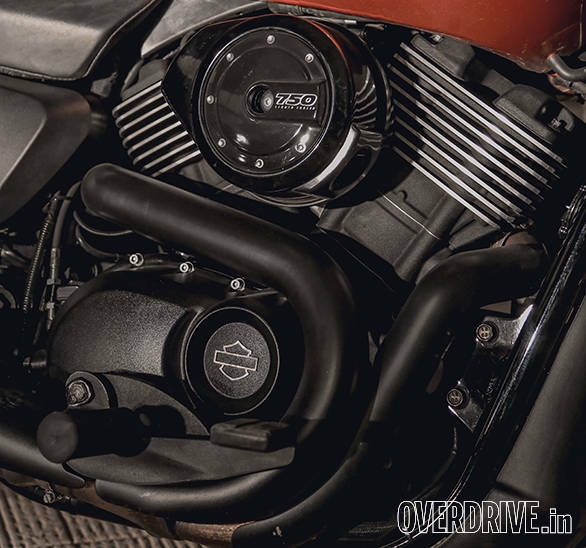 The liquid cooling, chain driven cams and balancer shaft, all contribute to a fairly refined motor that won't shake you to bits or singe your inner thighs. And though it still does heat up in traffic, it's nowhere near the roasting that you'd get from its air cooled brethren. What isn't very Harley-like though is the sound. It's more of a mumble at slow speeds and only picks up character once revs build up. This means that when you're pottering around town, seeing and being seen, the soundtrack is not quite as good. The Street 750 surprised us in the handling department as well. We expected the stability but what came as a pleasant surprise was its ability around corners. The increased ride height and resulting increase in ground clearance allows for fairly spirited cornering. And the low centre of gravity brought about from the shorter engine and overall low slung chassis mean that it's stable and neutral in feel. You will eventually ground a peg but not before you've had some fun and at not too slow a pace that it deters you from having some more fun once you realise that you have reached the limit of its abilities. With a nice handling chassis and suspension to match, one can easily assume that a good handling setup would suffer in the ride quality department but thankfully that's not the case. And while the suspension is on the firm side, it still manages to isolate you from most things that our roads could throw at us. Really large potholes and small speed bumps are barely transmitted to the rider and even mid-corner bumps are taken in its stride. One negative mark on this test though was the brakes. It's not that the dual disc setup lacks power but the feel from both the front and rear end, under hard braking is missing. This is feedback that Harley has received from many quarters and hopefully they can come up with a solution as well as an ABS option to sort this out soon. On the whole the Street 750 impressed us and at Rs 4,10,000 ex-Delhi, it's incredible value for money. That's made even more attractive by Harley's finance schemes that also allow you an extra Rs 50,000 over the value of the motorcycle just for customisation. 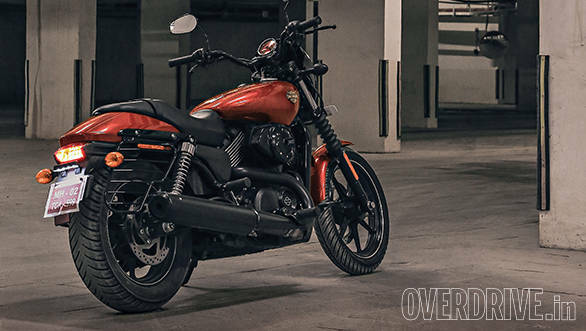 With the numbers they are expecting to sell both in India and across the globe, Harley-Davidson are actually wondering if they will meet the demand. It's quite feasible that the Street 750 will be the motorcycle we will soon be seeing on every street.